"The house on East Broad Street was built by a young doctor in town by the last name of Reed. He lived there with his mother. 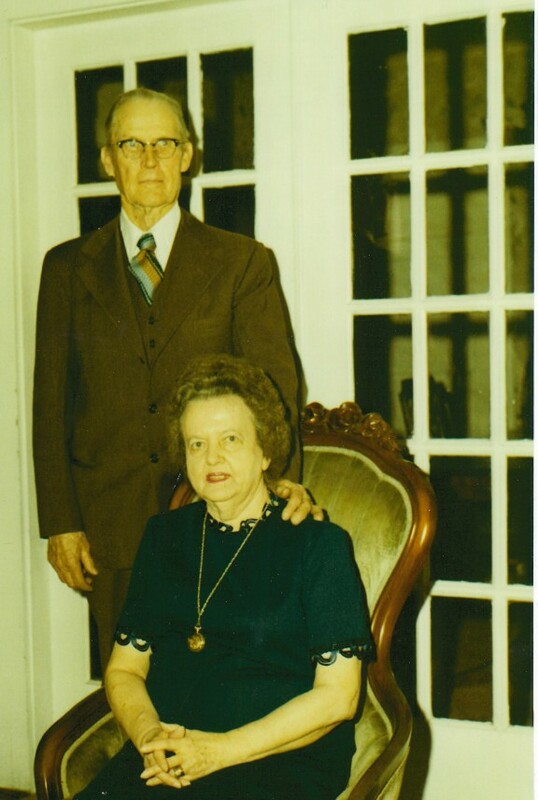 My parents, Floyd and Ella Davis, bought it from Jess Fleming who was part-owner of Fleming and Myers store on the square for many years. They moved into the house in 1923. "My father had gotten the job as mail carrier for Route 5 out of Livingston. He had to ride horse back then to deliver the mail, so the house with a barn and pasture was ideal. They raised hogs and chickens there, and always kept a milk cow back then. "The house had an attached well house from the back porch so you didn’t have to go outside for water, which was nice in bad weather. "There was a two-room building with an upstairs loft in the back of the property. When the house was built, that building was probably used for the hired help. We always used it for storage. "I always thought as a child that the barn was haunted. The first undertaker in town, Mr. Ridley, committed suicide in the barn loft. My father found him one morning when we went to feed the horses. He had cut his throat with a straight razor. Benton McMillen was the chief of police at that time. Floyd Davis and wife Ella Carmack were photographed in the living room of their home at 206 East Broad Street in Livingston. The photograph was taken in 1972. They had been married for 50 years at that time. "Grandfather and Grandmother Davis (Dr. James Washington Davis and his second wife, Delilah Peterman Davis) and their two children, Clarence and Orbus, moved to Livingston soon after my parents did. They lived upstairs in our house until they could find one of their own. My grandfather was a doctor, and in those days, few people had telephones, so they would come to the house at all hours of the day and night wanting the doctor. I don’t remember too much about my Grandfather Davis; he died when I was three years old of a ruptured appendix before he could be transported to Nashville. He was only 58 years old. "Next door to us was the Dixie Theater. We used to sit on the front porch on summer nights and watch the people arrive for the movie. In the summer they would open the side door of the theater. Little boys would sit in our side yard so they could see the movie. It wasn’t a very good view of the screen, but they didn’t seem to care. "Next door to the theater was the Brown Hotel. Sometimes when the hotel was full, Mrs. Brown would ask my parents to put a guest up for the night, which they always did if all the bedrooms weren’t already full of company. "Next to the Brown Hotel was the home of Mr. and Mrs. Lester Holman. Their daughter Marie and I were best friends from the time we could walk until today. Our mothers would dress us up each afternoon. Back then, little girls wore hair ribbons and dresses every day. "Next to the Holman house was the post office and Stephen’s Grocery Store where we bought all our groceries. "Across the street in front of the house and next to the Bullock Hotel (later known as the Dale Hotel) was a big barn. When guests at the hotel rode horseback or came by buggy, they would keep their animals there. The hotel was later sold by John Bullock to the Dale family. "On the opposite side of our house was a two-story house owned by Nora Dale. She lived there with her son, Russell. Next door to them was the Tim Stephens family. They lived in a two-story house that burned down one night. They rebuilt on the same lot. "It was always very frightening as a child to wake up in the night and hear someone running from door to door screaming, "Fire!" I remember my father having to be helped home, barely able to walk from exhaustion from having fought fires with the other men in town, having used bucket lines to fight the blaze. It was wonderful when the town finally had city water and a fire truck. "During the depression, people would often come to the house asking for food. Sometimes there would be entire families that would arrive at the door. My parents would always see that they had plenty to eat and no one was ever allowed to leave hungry. "When I was growing up, the house was filled with friends and family. They would come to town by horseback or buggy to shop, to see the doctor, or catch the train. "During World War II, we were awakened one night by soldiers passing in front of our house. They were moving the troops that were on maneuvers in Tennessee. As they marched along, all our neighbors gathered by the side of the road to greet them and to wish them well. "As I child, I also remember bands of gypsies occasionally traveling by our house on their way in or out of town. While fascinated by their colorful garb, they frightened me and I would run to find a hiding spot. Remembering hearing stories of how gypsies kidnaped little children, I wanted to make sure I would not be found! "Livingston was a great place to grow up and I have many happy memories of my years there." 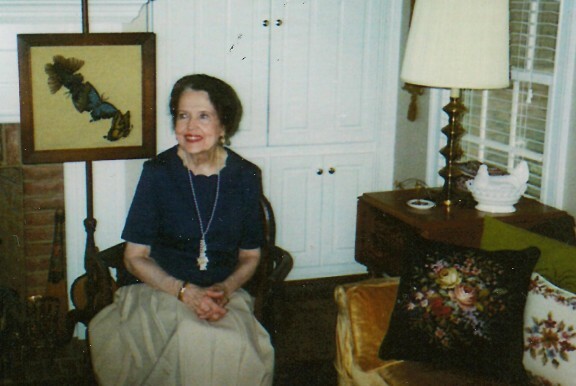 Geraldine Davis Amon, the daughter of Floyd Davis and wife Ella Davis, poses in her home in Simpsonville, South Carolina. She remembers her former home on East Broad Street in Livingston a place for wonderful childhood memories.